This reversible terry-lined shower cap is an all-around upgrade of the typical ones. The roomy cap feels comfortable on—no forehead pinches or creases. The waterproof side is made of recycled plastic bottles and helps block frizz-inducing humidity while it keeps hair dry. Wear it terry-side-out when deep conditioning or doing a hair mask with no worries. This shower cap is washing machine-friendly. Comfortable band that doesn’t scratch your forehead or neck. Water doesn’t leak through. Best shower cap I ever used. 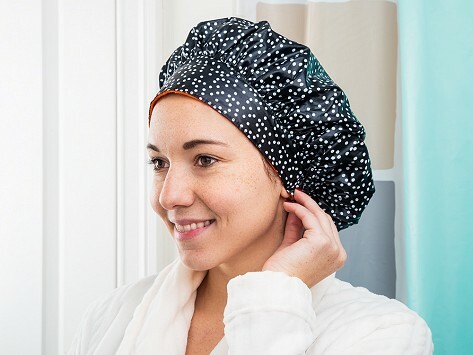 TIARA Shower Cap® Maker Zuly Matallana created a forehead-friendlier shower cap when she got fed up with the cheaper plastic ones she was using to protect blow-outs. She researched fabrics and shapes before landing on her new take on the showertime classic that is an upgrade in every sense, from the materials to the wearing experience. Zuly’s design is roomier than typical shower caps, so it works for all hair types and lengths. And she made sure the band feels comfortable and won’t pinch skin or leave creases. The reversible shower cap’s waterproof side is made from recycled plastic bottles while the other is lined with soft terry cloth. Wear it plastic side-out to block humidity and help prevent frizz when you’re showering. Flip the cap terry side-out for deep conditioning treatments or hair masks—and then toss it in the washing machine when you’re done.